I’ve put the Scoop Pullover on hold so I can get my holiday knitting done. I have the extra time to work on projects since I’m out of work so I’m hopefully to have lots of handmade things by Christmas. 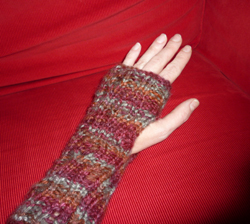 The pattern is in the current issue of Creative Knitting and called Drop the Gaunlet. It incorporates dropped stitches in the pattern which I’ve never done before. It’s pretty cool to purposely drop stitches and ripped them down. The set includes a scarf but I don’t think I’ll have time for that.